Durability and high performance are the characteristics of our Metal Flanges. The Metal Flanges can be easily used to connect two different pipes and is widely used in several industrial applications. We offer these Metal Flanges only after performing all the required quality tests. 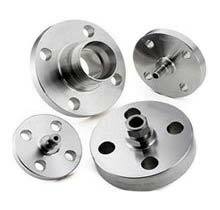 Our Metal Flanges are precision engineered available in different sizes and specifications. Stainless Steel ASTM A182 F304/ 304L/ 304H/ 316/ 316L/ 317/ 317L/ 321/ 310/ 347/904L/ etc. Carbon Steel ASTM A105/ A105N/A694F42/46/52/56/60/65/ 70 / A350 LF3/ A350 LF2, etc. Types Weldneck , Slipon, Blind, Socket Weld , Lap Joint, Spectacles, Ring Joint, Orifcae, Long Weldneck, Deck Flange, etc.